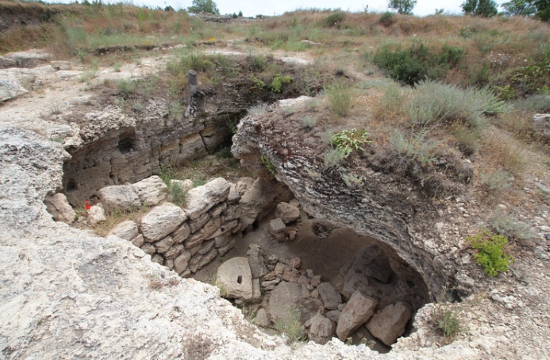 Researchers from the Russian Academy of Sciences Archaeological Institute found a previously unknown ancient Greek settlement in eastern Crimea on Friday, a TASS report notes. Chairman of the State Committee for the Protection of Cultural Heritage of the Republic of Crimea Sergey Yefimov, told the Russian news agency “Researchers from the RAS Institute of Archeology uncovered a new ancient Greek settlement during their excavation near Kerch, which, preliminarily, dates back to the 4th-3rd century BC, a period when the Bosporan Kingdom was flourishing. This is an important finding not just for Crimea but for all of Russia,” he added, pointing out that the discovery was made yesterday. Yefimov further clerified that the community, called Manitra, occupied an area of about 5,000 square meters. The outpost consists of an estate-like residential area and a domestic zone, made up of livestock pens and middens. He also revealed that a necropolis was found near the settlement, which hadn’t been looted, meaning there might be important findings to be made there.